Fencing a farm is a time consuming, expensive, never ending project. If you're buying country property, pay serious attention to the fencing—or lack of it. Our fencing leaves a lot to be desired—and that's after 20 years of working on it. Much of our property isn't fenced at all, and most of the fencing we do have is either falling down or not good enough for sheep (before my sheep and I moved in 11 years ago, Joe raised hogs and cattle). 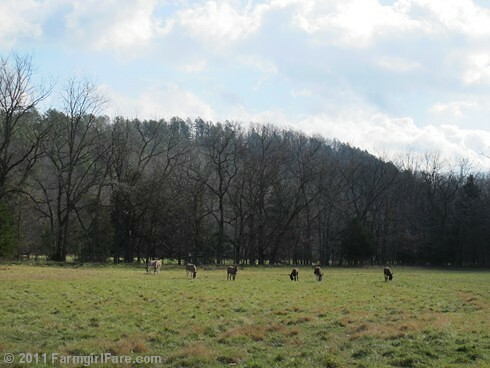 We would love to cross fence the heck out of our pens and pastures, and we would really love to fence the entire 3½ mile perimeter of our 240 acres—most of which is on wooded, sloped terrain—but we both know that's a dream that will probably never become a reality. But thanks to 10 strands of barbed wire and a large outlay of cash three years ago, our entire 16-acre front field, which is one of our main grazing pastures, is now totally secure. It'll never pay for itself, but the peace of mind those thousands of dollars bought is priceless. Because it's deer season, and because not every hunter can tell a donkey or a sheep from a deer, we have all the sheep and donkeys—except the three rams and Teddy, my giant pet wether who is keeping our youngest ram company—out in the front field. Between the fencing and the guard dogs, everybody should be safe. Well, except for the moles that is. Want more farm life tidbits? Here. More Daisy and Marta? Here and here. 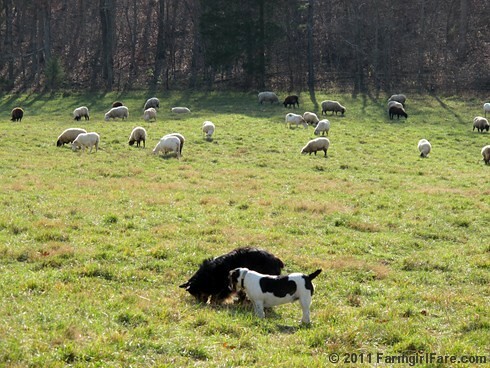 © FarmgirlFare.com, where we love the wide open spaces, but our motto is Please fence me in—and it's always open season on moles. How many dogs does it take to dig a hole?? Lol.. love that! Yup, those moles look in trouble. I had friends who lived on 2 acres in Napa that thought they were going to heaven when they bought 250 undeveloped acres in Tennessee. They didn't know about wells, leach lines, fences, electric access, or any of the several other things that become an issue in rural areas. They were back in a couple of years, very tired and mostly broke. I'm sure lots of your readers are also rural people who know what your life is like, but I think it's great when you explain some of the details for those (from suburban California) who think your life is idyllic. Just so they'll be prepared if they want to try it. Glad to see the mole patrol is still hard at work! 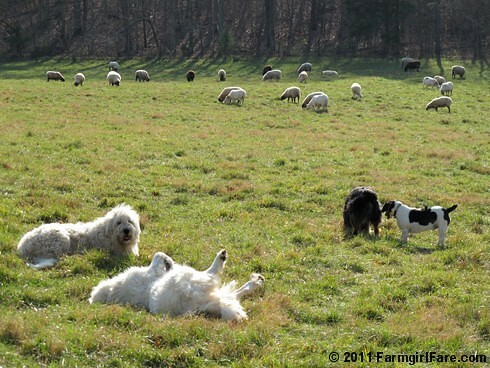 I love reading about your farm life (and I would dearly love to live on a farm! ), but I never take for granted how hard you work and that farming is not an inexpensive way of life - thanks for reminding us about both the beauty (and the not so beautiful) aspects that come with it! Oy, fencing.... If I had only known. We had no fencing when we brought our "free" mini flock of sheep and goats home. So we had to scramble, and ended up spending hundreds upon hundreds of dollars on fencing that doesn't even work that well...and doesn't fence in that big of a space. I hate it, but we can't keep dropping $$$ on fencing at the moment. Now I drool over barns and fencing at other farms... Lesson learned. PS. And we're SO jealous of people raising pigs or cows...one strand of electric and you're good!